The Barr & Stroud Skyline 7x50 is a seafarer´s binocular! 7x magnification, easier to hold steady at sea, in combination with 50mm objective lenses produce fantastic light gathering power essential for a night observation, delivering an exit pupil size of over 7mm, exactly the same size as a fully dilated human eye. The Skyline 7x50 is fully waterproof and fog-proof with full O-ring seals and rubber armoured for protection so it can be used in all weathers, or left in safety on a cockpit sole immersed in sea water! Solid aluminium die-cast body. Built to ISO9001 & 140001 certification. Top quality Barr & Stroud Bak-4 optics and solid, reliable mecanics make this bino a stunning bargain. These binos are a great general use size and are regarded as the standard size for nautical use - with an almost ideal relationship between magnification and aperture, the 7x50 size will deliver stunning image brightness and allow detail to be seem on the twilight horizon that cannot be seen with the naked eye or with binos with a higher magnification to aperture ratio. This size is often referred to as a "night glass" as it has great light gathering power and will show the user a much brighter twilight and nightime views than most other sizes (they are highly favoured by yachtsmen for this reason). The Skyline is a serious binocular for astronomers and yachtsmen: all lenses and prisms are BaK-4 glass with all glass surfaces are fully anti-reflection coated. 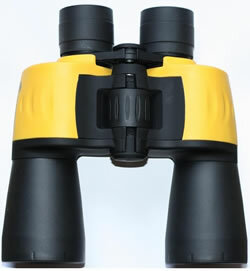 The rugged, high visibility yellow shoulders and rubber armoured body has a comfortable high quality feel and features a tripod fitting bush (again, making this binocular ideal for astronomy use). Supplied with caps, padded pouch case, and wide, comfortable neck strap.